Next up in 2011 Book Countdown... Racism! War! Ignorance! Yippee! Summary: It's after World War I. The Depression is on. And Germany has a sparky new chancellor, Herr Adolph Hitler. The US, replete with its own antisemitic attitudes, is more concerned with having its loans repaid by German businesses than with calling the new Nazi regime to the carpet for rising persecution of Jews and obvious acts of general aggression. In the midst of this, the new American ambassador to Germany, William Dodd, arrives with his family, including his sexpot daughter, Martha. 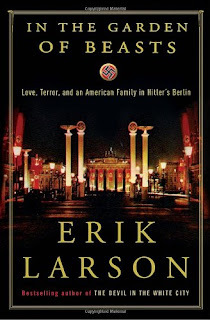 The book chronicles the gradual awakening of the scholarly, Jeffersonian democrat to the realities of the Nazis' brutality, as well as Martha's romantic and social escapades with high ranking Nazi officers and Communist representatives. Thoughts: I think what is shocking to modern American readers is the pervasiveness of hateful attitudes towards Jews, in America and abroad. Throughout the narrative, the Americans dealing with the Nazi assure them that they have found more humane ways of dealing with "the Jewish problem." Um... what? Evidently, a huge portion of the population in America wished that Jews weren't around, or at least didn't have as many prominent positions in our culture (BTW, 13% of Americans today still think that Jews have too much power... yikes). That was really eye opening, to be confronted with the reality of our own legacy of hatred and indifference to the treatment of others. There seemed to be an unspoken code running through the culture about how Jewish people look and act. In fact, when trying to minimize the fact that all these American tourists where being beaten in the streets of Berlin (yeah, that was going on), a reporter comments that these Americans probably brought it on themselves by being mistaken for Jews in the way they were acting. A) This implies that there is a Jewish way to act that merits attack and B) implicitly validates attacks against the actually Jewish victims. It was not easy to hear all of this thinly veiled contempt for an entire group of people. This aside, I'm trying not to just word vomit all the super interesting topics that Larson explores in this book. And they are many: the routine attacks in the streets on foreigners by Nazis, the ambivalence of the Roosevelt administration on how to interact with the new party, the unwillingness of many to see the writing on the wall, the elitism within the American foreign service itself, the sexual taboos of the time, the perception of Communism in the US, and on, and on. Larson tackles all of these topics effortlessly in his narrative, dropping fascinating little nuggets on every page. He also paints a lovely picture of Mr. Dodd as a Cassandra figure- a tragic hero who was roundly ignored by his superiors as he tried to open their eyes to the growing threat of Hitler. You feel so frustrated as he and his righthand man send frank and alarming reports that are dismissed out of hand by bureaucrats who just care about debt repayment. What comes across strongly is the fatal "wait and see" policy of the rest of the world at a point when the Nazis could have still been stopped. This book is one that has to be read, not described. I think it is a truly important work that has hopefully sparked debate on America's historical blind spots to injustice, as well as cause some self reflection on the injustices that we are turning our back on today. Maybe this will become a standard text for high school world history classes - I think it's accessible enough to open up the dialogue on the political machinations of the era. I would highly recommend this book for just about anybody - great for book clubs, great for dinner table conversations. What did you think about In the Garden of Beasts? Did it scare you as much as it did me? Only one 2011 book left... what will it be? This book showcases Larson's ability to narrow the focus enough that the reader is not overwhelmed by ephemera. His choice to focus on one family works well, and through this lens I was better able to understand pre-war Germany and the conflicting views of America (as well as the classism and racism that pervaded our society and government at the time). 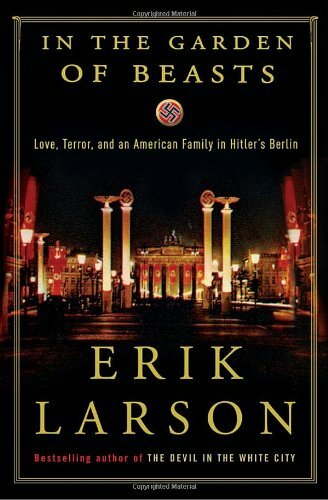 Larson is not heavy-handed in his telling, and he allows us to see the humanness of even Hitler. While this book wasn't the all-consuming read of "Devil," I did manage to read it within days of beginning it (quite a feat for any title during this busy fall). If you are interested in WWII, but (like me) knew less about the inter-war years, you may find this book an interesting eye-opener to the workings of government and role that ambassadors play. I agree completely that Larson's gift is using a narrowly focused story to tell a larger tale. By focusing very specifically on the Dodds, he is able to paint a broader picture that covers the culture, politics, and "spirit of the age" of the inter war years in the US & Germany. I'm in the middle of "Devil" and agree that it moves a quicker pace - it's pretty amazing that Larson is able to work his voodoo on such a wide range of historical topics!